An irresistible new range of lift-the-flap nursery rhyme books, designed to capture the imagination of young children. A great matching game on the last page invites a closer look at the detailed pictures.An irresistible new range of lift-the-flap nursery rhyme books, designed to capture the imagination of young children. A great matching game on the last page invites a closer look at the detailed pictures. 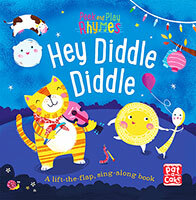 Hey Diddle Diddle combines lively pictures with a classic rhyme that's easy for parents and carers to recognise and recite. Young children will adore searching the page for flaps to open while singing along as they recognise all the friendly characters in this timeless rhyme. The spotting game at the end is a great incentive to go through the pages once again until each tiny thing is found!